Now, I am usually first inline when it comes to writing scathing book reviews. I have very little patience for novels that don’t keep up a certain pace, or possess an interesting narrative voice. Which is why when it comes to actually writing book reviews, I either do it to release the pent-up anger at wasting my time on drivel, or because I have enjoyed a piece of fiction so much that I feel it merits recognition. Wrong. So very, very wrong. 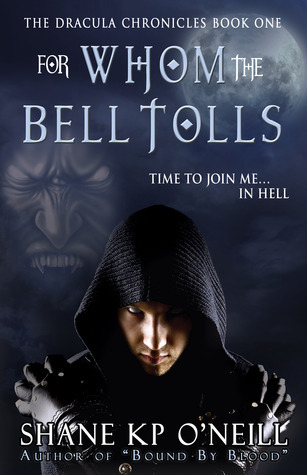 For Whom The Bell Tolls is a precise, masterful and engaging piece of work. A thrilling page-turner with very real characters, this is an age-old tale told like you’ve never heard it before! The new craze of ‘teenage vampire angst’ had made me so fearful of ever picking up a book with the ‘vampire’ concept ever again that when I started ‘The Dracula Chronicles’, I did so tremulously. Within the first two paragraphs I knew that I had picked up something that was so beyond my expectation, I struggled to put it down. There is no teenage angst here, only the ancient tale of the war between heaven and earth, personified in a unique, historical setting. For Whom The Bell Tolls draws on historical fact, mythology and religion all at once to create a masterful construction that will have you anxiously turning the page. A dynamic, richly dimensional story, this book does not sacrifice pace for detail, with O’Neill effortlessly joining the two in a rich text. If I had one complaint, it would be the occasional modern word which appears in the description, but that it’s itself is a weak objection as it does nothing to the quality of the text and the engagement for the reader. The story follows the tale of two men, Vlad and Andrei, half-brothers who will in turn become the champions of Good and Evil. And yet, the story begins with them as young boys, privy to human emotions, petty sibling rivalry and childish stubbornness as slowly they become exposed to the cruel world around them and begin to exhibit wondrous powers. This tale takes no sides and is as much an examination into the human condition, as it is an action-packed origin story of two brothers’ who will battle over the fate of all humankind. This goes on Madeleine’s 5/5 Book-Shelf.